He stood there, day after long day, braving the elements, fighting for his space. He stood there, through wind and rain, snow and hail, light and dark, thinking of what lay ahead. He stood there, searching for a hint of calm, the sunshine, the starry night under a cloudless sky. He stood there, dreaming of the day, the time, the moment, when freedom would be his. Freedom from the shackles that bound him to this earth. Freedom from the burden of responsibility that was his to bear. Alone. He stood there, waiting for the mist to lift and the fog to clear, so he would see the world again. See it clearly, the way he always meant to. He stood there waiting for the dawn to come. But reality stretched time into unblinking darkness. These are my School Run Colours for this week. 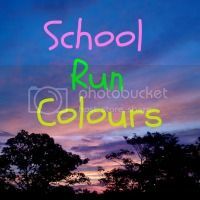 If you are new to the School Run Colours linky, you can read all about it here, including how to link up. I am also linking up with Prose For Thought hosted by the lovely Victoria at Verily Victoria Vocalises and with The Prompt hosted by the wonderful Sara at Mum Turned Mom. It's interesting how you viewed the scarecrow as a figure that was tied and duty-bound. It makes him seem such a sad fellow. I did feel that when I saw the poor thinking braving gale force winds the other day. What if he did have emotions! I don't think I've ever felt empathy for a scarecrow before now - fantastic poem! Thank you Maddy. Just trying to step outside my comfort zone with the creative writing. I have to agree with Maddy. I really feel for this scarecrow! Glad you enjoyed reading it Tracy. Thanks for hosting #ThePrompt Sara. Coupled with my #SchoolRunColours, I find inspiration to write a piece each week.